The author of four seminal works on science and culture, Donna Haraway here speaks for the first time in a direct and non-academic voice. 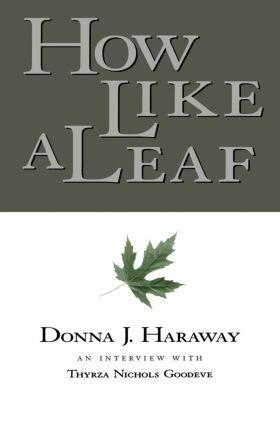 How Like a Leaf will be a welcome inside view of the author's thought. "Her extreordinayr mobility of point of view thrwarts bloc politics,flows like cool water over devastating oppressions -Linda Brigham, Cultural Studies October, 2001." Donna J. Haraway is Professor in the History of Consciousness Board at the University of California, Santa Cruz. She is the author of three Routledge books, Primate Visions (1990), Simians, Cyborgs and Women (1990), and Modest_Witness@Second_Millenium.FemaleMan_Meets_OncoMouse (1997). Thyrza Nichols Goodeve holds degrees from the University of California, Santa Cruz and NYU. She is a freelance writer in the areas of art and culture.